Herbal Infusions: Why Are They So Popular? In a world where we love our cup of Joe, there is a major shift that is happening where we are striving for a healthier beverage. Our addiction to caffeine is regarded as unhealthy, so we are looking for healthier alternatives. Enter the herbal infusion revolution. Herbal infusions, also known as herbal teas, are generally created from herbs and flowers (while there are differing definitions online, I treat fruit infusions separately). They are often used as herbal remedies. One key benefit is that they normally are caffeine-free which is a main attraction for tea lovers since caffeinated drinks have diuretic effects if your body isn’t used to drinking caffeine. Herbal infusions are also versatile: you can drink them hot or cold, and you can also add them to some teas to enhance the flavor. Now when we talk about herbal infusions we’re not talking fruit infusions which are proving to be very popular on the supermarket shelves. Fruit infusions, while they can taste delicious, are really sought after for their taste rather than health benefits and tend to often be made from synthetic ingredients (always look on the packaging). Herbal infusions on the other hand, are said to have therapeutic benefits and are sometimes blended together to create natural remedies in the way of tinctures, creams and ointments. Each herbal infusion has their own unique health benefits and here are some of the most popular when brewed as a beverage. Chamomile: This herbal is a regular feature in many cafes and restaurants and has the capacity to sooth and calm the nerves. Originally found in Egypt the taste of this herbal is said to be floral and reminiscent of apples if brewed correctly. If one oversteeps the tea, then bitterness will ensue. Other health benefits include its ability to aid sleeping, eliminate nausea, soothe nervous tension, and it is great for colds and anxiety. 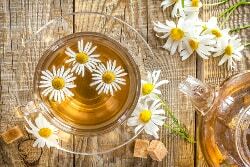 More details can be found in Fun Facts About Chamomile Tea article. Peppermint: Another regular on tea menus around the world is peppermint which has the ability to sooth an upset stomach and relieve us from anxiety or stress. The menthol in this brew gives it a cooling sensation which can help break down the fat in the digestive system. It can also be used as a muscle relaxer, in addition to relieving a person from headaches and chest pain. Peppermint is traditionally sipped to help relieve the symptoms of a cold with its ability to open up our airways to help us breathe more easily. Ginger: Ginger is a popular herb in Chinese Herbalism and Ayurvedic Medicine touted to have a whole host of health benefits. Ginger is full of antioxidants, and due to its warming properties can help to boost the immune system, aids digestion, is said to relieve nausea and can help to stimulate circulation. Ginger is often added to lemongrass and even lemon itself. Black, oolong and even rooibos might feature ginger as well. Rooibos: This herbal is the new kid on the block although South Africans have been drinking this herbal for over 300 years. It is one of a very few herbals that one would consider adding milk and sugar to and has a whole host of health benefits. Rooibos contains a good source of antioxidants (which most herbal infusions do not), can boost your immune system, is said to be able to reduce stress and has a potential to treat diabetes. A South African mother wrote a book in the 1960’s claiming that it helped sooth away her baby’s colic. You’ll often find rooibos with herbs, flowers and flavorings such as vanilla added to it. Here are 3 further reasons to drink rooibos. Well, hopefully you now know a little bit more about herbal infusions, and will try some for yourself.